The 2,700 species of Hydrozoans are related to jellyfish and corals and are on of the main groups of the Cnidaria. They are very small predators some of which are solitary and most live in colonies. Most Hydrozoans live in saltwater but some species, like Hydra, are found in freshwater. Most hydrozoans have both a polyp stage and a medusa stage in their life cycles. Most are found as small colonies made up from tiny polyps connected together by hollow stems (called hydrocauli). Colonies may produce calcium carbonate skeletons or be covered with a flexible exoskeleton made from chitin. Most colonies are usually only a few centimetres across, with a tree-like or fan-like appearance. Some form delicate branched colonies, while others, known as "fire corals," form massive colonies that are similar to true corals. Other colonial hydrozoans, such as the Chondrophorines (e.g. By-the-wind Sailor) and Siphonophorans (e.g. 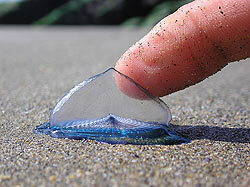 Portuguese Man o' War ) swim in the open oceans using internal gas-filled floats to help their buoyancy. Some siphonophores may reach lengths of over a metre and migrate up to 300 metres vertically in an hour. Within a colonial species, most of the polyps are specialized for feeding. These polyps have a cylindrical body with a mouth surrounded by tentacles. These polyps contain a central cavity in which digestion begins. Partially digested food may then be passed into the stem for distribution around the colony and completion of the digestion process. Other polyps in a colony are specialised for reproduction. These do not have tentacles and contain numerous buds from which the medusa stage of the life-cycle is produced. Some colonial species also have other types of specialized polyps, for example some have defensive polyps which have large numbers of nematocysts. 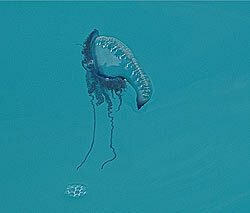 The medusae of hydrozoans are smaller than those of typical jellyfish, ranging from 0.5 to 6 centimetres in diameter. Some solitary species can grow much larger to 6 to 9 centimetres in most cases. The body of a hydrozoan medusa has a dome-like umbrella shape and it is ringed by tentacles. A tube-like structure hangs down from the centre of the umbrella, and includes the mouth at its tip. Most have only four tentacles with nematocysts on them and around the mouth. The rim of the bell contains muscle fibres which allow the animal to move along by contracting then relaxing its body. Just inside the rim there is another layer of tissue which narrows the opening at the base of the umbrella. This narrowing increases the force of the water expelled expelled by the animal and allows it to swim faster. Hydra, found in slow-moving waters, are the best known and most researched freshwater hydrozoan. 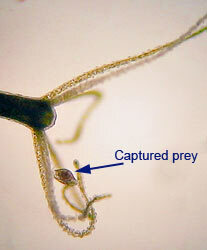 Hydra has a base plate that helps it attach to substrates, and like all cnidarians uses nematocysts to catch its prey. They eat small crustaceans (e.g.brine shrimp), insect larvae and annelid worms. Hydra may reproduce sexually, through the spawning of sperm (and thus insemination of eggs on the female body column), or through asexual reproduction (budding). 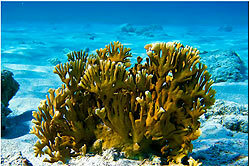 Millepora alcicornis, or fire coral, is not actually a true coral, but a hydrocoral. skeleton, making them more closely related to jellyfish than true corals. by an itchy welt that can last for several days. that gets entangled in a Man o' War's 50 foot tentacles.